Another 2 festivals to tell you about. The Arizona Underground Film Festival in Tucson, AZ is considered one of the biggest underground film festivals in the US. BROKEN will screen on Tuesday September 22 at 7:30pm. 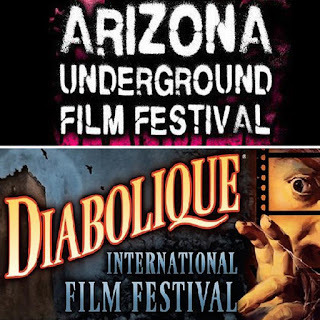 At the same time is the Diabolique International Film Festival which is presented by Diabolique Magazine, the fastest growing publication dedicated to genre cinema. Diabolique takes place Sept. 25 - 27 in Bloomington, Indiana. My love for the horror genre is no secret and I am very excited about being part of these events. This place is stunning. The architecture of Los Angeles event space is beautiful and the decoration is spectacular. Environment was transparent and resonant and warm and immediate. I loved this place and my experience here was very exciting.